The Fortress begins to rise from the Arctic floor and Superman tries desperately to get inside but finds it is still refusing to recognize him. The Puzzler and Vandal Savage have already merged the Justice League satellite and the Stormwatch carrier into a huge floating technobase and the Fortress is rising up into the atmosphere to add to their power. Superman is unable to stop the merger but with all his might smashes into the main section of the base. The Fortress defenses attack Clark and block his entry with a forcefield and Vandal reveals he was able to alter the recognition signature of the Fortress for he and his kin. Wonder Woman watches as the moons of Jupiter move to allow the technobase a clear path to deep space and unable to stop it she races instead to aid Clark. As Vandal attempts to harness the Fortress power source Puzzler informs them that both Wonder Woman and Superman have joined forces to stop them. 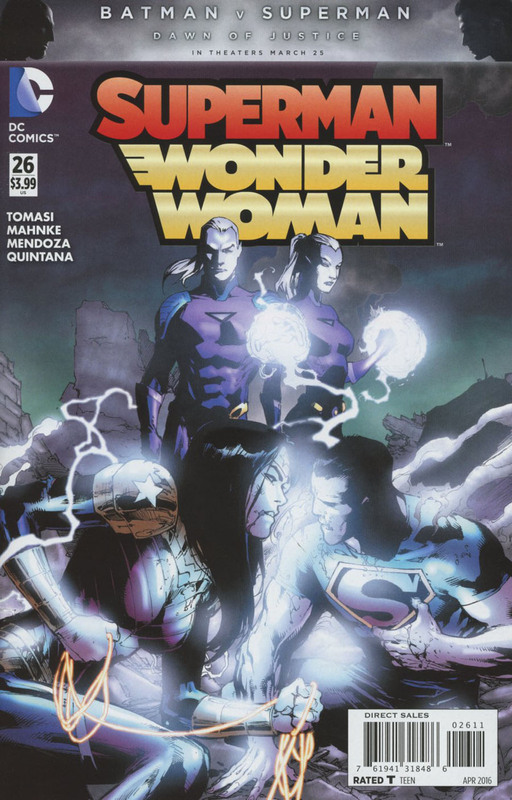 While Vandal tries to draw the comet that empowered him closer he sends his twin children to fight Clark and Diana. The technobase uses the earth's core and its combined power to draw the comet in with a powerful tractor beam while Diana fights the twins. 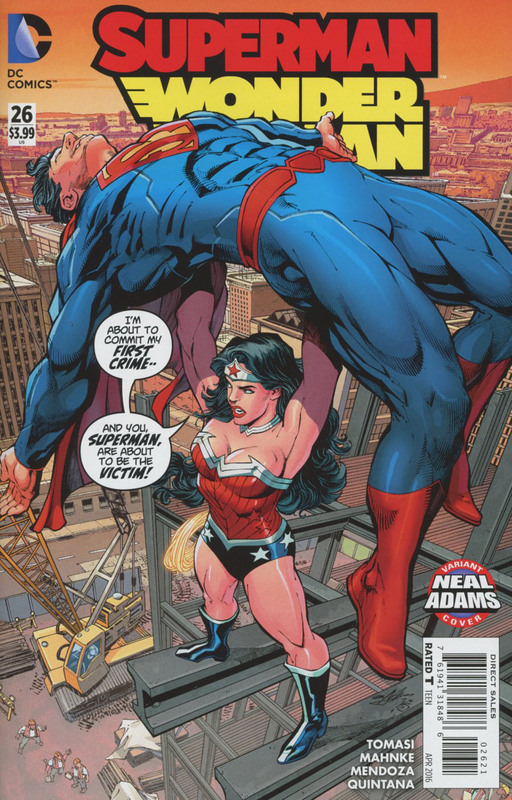 Clark tries to pull the technobase down to earth and as Diana knocks out the twins she watches as Clark seemingly pulls the base down around himself in a mighty explosion. Story - 5: As Vandal's master plan nears its climax the action amps up and Tomasi delivers a great issue showing Clark's determination and Wonder Woman's strength. Storyline wise it is thin on the ground but what little development there is is enough to keep my attention and tie up some loose ends such as why the Fortress refused him entry all this time and that prequel chapter of Vandal's origins. So in this case the actions speak louder than words but it is a great segment of Savage Dawn. 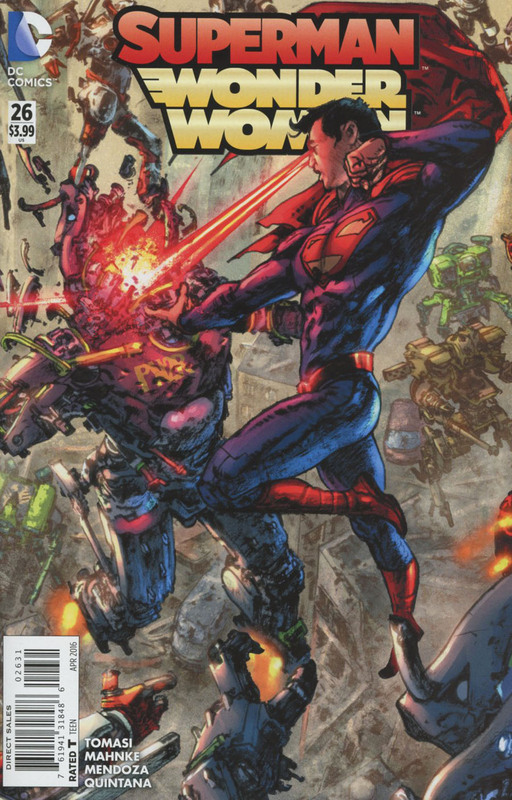 Art - 5: It is difficult to fault Doug Mahnke here, the artwork is unrelenting, superb, powerful. I found myself really connecting with Clark through the art. If I was to criticize anything it is that Clark still seems a bit to muscular even for a superhero and maybe the inking could have been a little heavier in places, but that's really me grasping at straws. Cover Art - 3: Everything is there, ingredients-wise but it just seems so dull. The peril isn't there, none of the action or emotion that is so prevalent inside comes across in this cover. Neal Adams Variant Cover Art - 3: I want to love it, the classic feel of it reaches out to my inner geek and like the main cover, the ingredients are there but this time the perspective and composition makes me analyze if it's physically possible, if the angles are right, if the scale is correct. That to me provokes the reaction I don't think they were aiming for. I don't want to question the art, I want to enjoy it. Triptych Variant Cover Art - 3: As only a segment it is tough to review it as a singular piece. I find the inking and art a bit brash so though brimming with action it just wasn't much to my liking. Once the other pieces are present I'm sure it will present a much more exciting cover but just now it seems a bit on the rushed side.